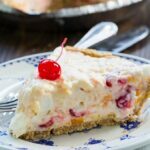 Ambrosia Pie has all the yummy flavor of an Ambrosia Salad in a delicious graham cracker crust. It’s an easy, no-bake pie that is ideal for spring and summer parties and potlucks. It can be prepped in no time at all. If you’re not familiar with Ambrosia Salad, it’s a longtime southern favorite made from whipped cream, pineapple, oranges, and coconut. Usually nuts and cherries too. If you’re an Ambrosia fan, check out these Ambrosia Macaroons. Using a premade graham cracker crust really makes this creamy Ambrosia Pie a cinch to make. Look for a large one. This recipe makes lots of filling! 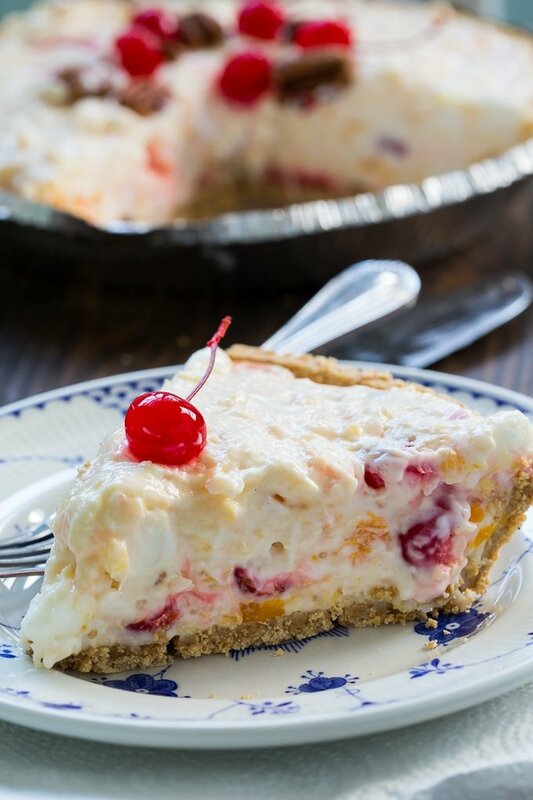 The creamy and dreamy filling is loaded with mandarin oranges, crushed pineapple, marshmallows, coconut, and maraschino cherries. There are a number of ingredients to mix together for the filling, but it goes really fast. A block of cream cheese, a can of sweetened condensed milk, a small carton of sour cream, and a box of cheesecake instant pudding mix, plus a little lemon juice form the base of the filling. Then all the goodness gets folded in and the filling goes into the graham cracker crust. 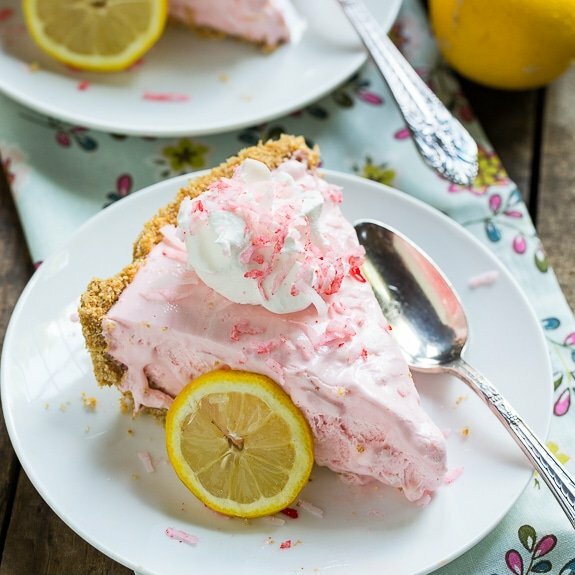 This no-bake Ambrosia Pie needs to chill for a few hours and then it is ready to be devoured. Ambrosia Pie has all the yummy flavor of an Ambrosia Salad in a delicious graham cracker crust. It's an easy, no-bake pie that is ideal for spring and summer parties and potlucks. The filling is full of oranges, pineapple, coconut, and cherries. Beat in sweetened condensed milk and lemon juice. Beat in sour cream and dry pudding mix until smooth. Gently fold in pineapple, oranges, coconut, and cherries. Spread into graham cracker crust. Garnish with pecans and cherries. Cover and refrigerate for at least 2 hours and up to 3 days. 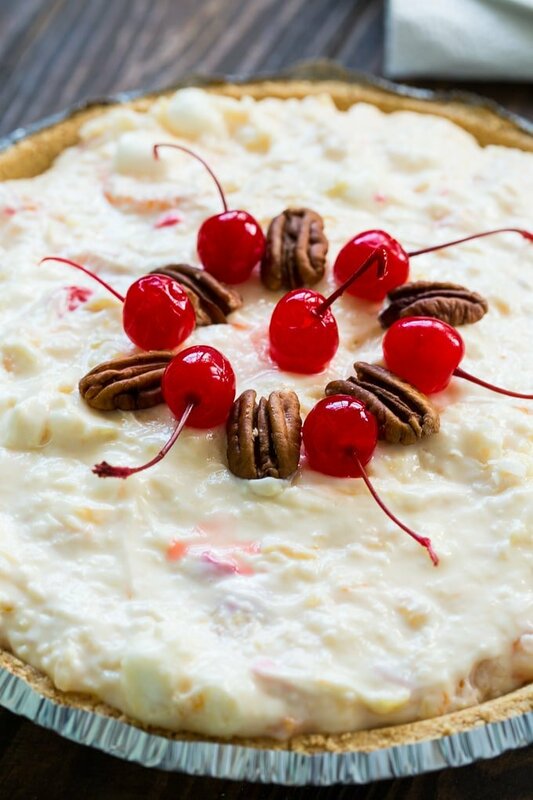 This entry was posted in Pies and Tarts and tagged ambrosia, no bake, pies. Bookmark the permalink.